Drug testing is among the graduated sanctions available at the Community Corrections Center in that participant behavior can be met with increased or decreased testing frequency based on drug testing results. Community corrections center provide drug testing for participants at intermediate sanction level II, III and IV. The drug testing system is modeled after the American Probation and Parole Association’s Drug Testing Guidelines and Practices for Adult Probation and Parole Agencies. Random drug testing is the primary method of monitoring coerced abstinence. Random methodology is preferred in order to control cost and reduce the opportunity to ‘beat’ the test. Upon assignment to an intermediate sanction level, participants are assigned a drug testing color. The assigned color corresponds to the participant’s risk level. Participants are required to call a toll free number daily in order to determine what color will be tested that day. When a participant’s color is selected on a particular day, the participant is required to report for drug testing. Specimen collection is observed by staff. Testing is conducted on-site. On-site testing ensures immediate accountability for intermediate sanction level III, IV participants. Urine specimens are screened for illicit drugs via enzymatic immunoassay technique. Federal cut-off levels promulgated by the Substance Abuse and Mental Health Services Administration reduce false positives. Typically specimens are screened for four drugs of abuse, which may be altered based on demand. Gas chromatography/mass spectrometry technique is used for confirmation. 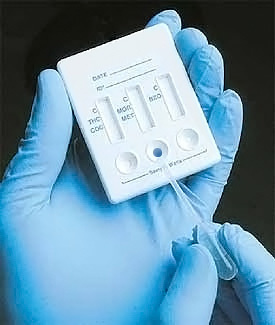 Breath alcohol testing is conducted via portable Breathalyzer.